What your expectations regarding this course having into account the Introduction? 1. As a professor in the various formation stages of my Province, and in various institutions of different congregations, I am interested in a deep study, together with reflections and prayer about the Holy Spirit, in order to help others and myself to rediscover RUAH in our own Institutes through the Charism and Mission; in the Founders and in the whole universe. 2. I wish to collaborate with the Holy Spirit in His work of sowing the seeds of communion and and solidarity among all human beings specially among all Indians. 3. I wish to promote a renewed, active and alive vision of Holy Spirit rooted in the process of Evangelization, with all the challenges, needs and demands of our society in India. 4. I expect and pray to RUAH my God to enable and guide me to prepare a Thesis on The Holy Spirit which will encourage many to be attentive to Signs of hope to collaborate with Him to build the Kingdom of God on earth. 	The lack of Pneumatological vision and experience of the Spirit sows death everywhere. 	We recognize the presence of the Spirit everywhere, in all religions, and people on earth. 	Doctrine itself will not give life but what gives life is that which the doctrine is about. 	What save us is not solid doctrine, but real and active presence of God and his Spirit n us. 	The doctrine should be made alive so that it can touch and fire up the hearts of others. 	Jesus did not perform any act of love by doctrine, but doctrine arouse to understand, freeing, healing and rescuing Jesus. 	Unbiblical understanding of Spirit is something power, force, also which guide the conscience. 	Biblical understanding of Spirit is a person, God, Co-equal to Father and son. A person with mind, emotion and will. 	The summary of Pneumatology is about sin, righteousness and judgement. 	Give importance for three person of the Trinity- God the Father, son, Spirit. 1. It is fact that the presence of Spirit brings joy and peace. Also we learn that everywhere there is presence of Spirit, irrespective of multi religion, culture, technology. If it so why there is still violence, hateredness? 2. Why the power of Spirit is not able to overcome the evils of this world? 1. To be aware of the Holy spirit in the Church and in the people and within us. 2. To have a clear view of the Holy spirit. 3. 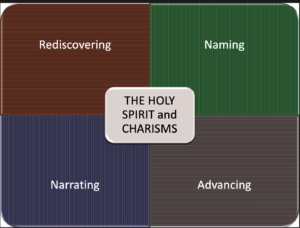 Going through this course we would like to experience the Holy Spirit in our life, in our charism and strengthen our will and dedicate our whole being through Holy Spirit to God alone. 4. Understand the works of the Holy Spirit. •	Doctrine teaches and enables us: to identify the real from the fake; to understand which way to turn on the many matters of our life that Jesus did not speak on. •	A doctrine without life is like a dead letter. It is not able to touch us inside, neither to put us into action, to fire up our passion, or to change our attitude toward life. •	The Holy Spirit is a Person. The Holy Spirit is God. And since He is God, He is also co-equal and co-eternal with the Father and the Son. •	Pneumatology teaches us that the Holy Spirit is: A Person, with a mind, emotions, and will. •	“The Spirit of God brings conviction of sin (Jn. 16:8). He imparts the new birth (Jn. 3:5). •	He indwells in individual Christian (1 Cor. 6:19) to comfort, guide, sustain, and strengthen us, and to bear witness to the truth. •	A good church will recognize the Holy Spirit both for who He is and for what He does. •	Where there is Mary our Mother, there is a presence of the Holy Spirit. •	We are the anointed ones of the Holy Spirit. 	The presence of Jesus (on earth) in the Blessed sacrament is a heavenly presence by the action of the Holy Spirit. 	We don’t give much importance to the Holy spirit who is (our church is a Christo-centric not in Spirit Centered) present and intervenes in the sacraments. 	The concentration can be in our Religious practices, sermons, Catechism to the children and youth, and in the teachings of the Church etc.…we should give enough priority to the Holy spirit. 	Sometime Holy spirit remains as the least understood person, therefore we need to find out ways and means to present the Holy Spirit to the people properly. Arian controversy is the inconsistency in their statement about the Nature and office of the Holy Spirit. The spirit and God are the same, This divided the Church. This Arians and semi- Arians, the son was created by the Father and the Spirit was created by son. The Emperor Constantine convoked a council in Nicaee were 300 Bishops who were living Martyrs stated that Arius’s views were heretical. They formed the Nicean Creed. We Believe in one only God, the Father and in One only Lord Jesus Christ, the Son of God, and in the Holy Spirit. Macedonius Bishop of Constantinople defended the doctrine that the Holy Spirit is not a Divine person but only as a force, and only as a instrument to act in us in the world. Athanasius affirms according to the Baptism of the formula “In the name of the father, and of the Son, and of the Holy Spirit” The Holy Spirit shares with the Father and with the son the same divine nature. “The Holy Spirit is consubstantial with the Father and the Son; that He is uncreated, eternal, and omnipotent, equal in majesty and glory, and that He proceeds from the Father and the Son”. He changed the traditional formula “ Glory be to the Father through the Son, in the Holy Spirit”. He changed into Glory be to the Father with the son and with the Holy Spirit”. He insisted in full divinity of the Holy spirit. “I believe in the Holy Spirit, the divine, the life-giving, who proceeds from the Father, who is to be worshipped and glorified with the Father and the Son, and who spoke through the prophets”. Gave us the prayer to the Holy Spirit. “come and link between the Father and the Son”. You are the Father when you rest you are the Son when you go ahead and you are the Holy Spirit when you are one with the Son. From where does Holy Spirit Come? The Holy Spirit comes from the Father through the Son. From the 5th century western Churches introduces the “Filioque” in creed. The Holy Spirt comes from the Father and of the Son. 1. The faith of the believers in the Holy Spirit -before the Council of Nicaea-. Holy Spirit -by whom they are, through Christ, brought near to God. 2. The great theologians were very clear about Jesus, but not about the Holy Spirit due to his nature and office. From the Scripture they concluded that God, the father, Jesus and Holy Spirit is one person. 3. The Arian controversy believed Holy Spirit as the creature of the Son. But then the Council of Nicaea formulated the Nicene Creed to give importance to Spirit and condemned his view as heretical. 4. Macedonius, the leader of Pneumatomachians spoke of the Spirit as a force or instrument of God, and not as a divine person. 5. For this Fathers of the Church defended like: Athanasius: the Holy Spirit shares the same Divine as the Father and Son. He or she is consubstantial with the Father and the Son. 6. St. Basil: made a new formula on Spirit: “Glory be to the Father, with the Son and with the Holy Spirit”. 8. In the council of Constantinople: it was said that Holy Spirit is not god, neither consubstantial to the Father and to the Son. But, Divine who proceeds from the Father. 9. This formula influenced the liturgy to invoke the Holy Spirit: the epiclesis. 10. Mario Victorino: the beautiful quotation on Holy Spirit: You are the Father when you rest, you are the son when you proceed, you are the Holy Spirit when you are one with the son. 11. According to the profession of faith of nicean and constantinopolitan: Spirit comes from the Father through Son. 1. For this Fathers of the Church defended like: Athanasius: the Holy Spirit shares the same Divine as the Father and Son. He or she is consubstantial with the Father and the Son. 2. Mario Victorino: the beautiful quotation on Holy Spirit: You are the Father when you rest, you are the son when you proceed, you are the Holy Spirit when you are one with the son. 3. Through the Scripture we understand the Spirit and God are the same. 4. In Arian Controversy – and semi Arian Controversy they believed that Father is the creator of the Son and the son the creator of the Holy Spirit. 5. Arian believed that the Holy Spirit is not God but Creature. So they defined the Holy Spirit is as the creature of the Son. 6. The emperor Constantine convoked a council in Nicaea. 7. The Bishops of Church were very sensitive to the detail of the doctrine. 9. The council of Nicaee changed the perspective of Arians and it led to the formation of the Nicene Creed. (I believe in God… in only God, and in only the Son and the holy spirit. 10. After some year, Macedonius -bishop of Constantinople defended the doctrine that the Holy Spirit is not a divine person, but only a force, an instrument of God. 11. Athanasius in his letters to Separion (356-362) affirms that the Holy Spirit shares with the Father and with the Son the same divine nature or divinity. 12. Basile –: “Glory be to the Father, with the Son and with the Holy Spirit”. He was accused of ambiguous innovation. To that accusation he answered with a beautiful text: Treatise on the Holy Spirit, written during the years 374-375. “I believe on the Holy Spirit”. 13. Gregory of Nazianzenus insisted on the full divinity of the Holy Spirit: a step beyond the pneumatological positions of Athanasius and Basil. 14. The epiclesis, or the prayer and invocation to the Holy Spirit, became one of the most important parts of the liturgy. The theology of the Church of Syria was Pneumatological. Efrem was called “zither of the Holy Spirit”. 16. The Nicaean and Constantinopolitan profession of faith (381 A.C) -shared by the oriental and western churches- confesses that the Spirit “comes from the Father” (DS 150). 17. The solemn profession of faith of the VII ecumenical council of Nicaean establishes that “the Spirit comes from the Father through the Son”. But starting from the fifth century, was introduced in some western churches, in Spain for instance, (we do not know the reasons!) the expression Filioque, that means that the Holy Spirit «comes from the Father and of the Son». The seven Gifts of the Holy Spirit are the clear sign of the perfection. Isa; 6 says that the gifts of the Holy Spirit are over the messiah. The Holy Spirit is beyond the WORD of The Father and beyond the Jesus. Holy Spirit is the unknown beyond the word. Urs von Balthasar says in his book the Theology of Beauty of God, The Holy Spirit is not only beautiful but also a beautifier. The Holy Spirit is free and his actions are mysterious. We have to have the presence of the Holy Spirit in our hearts not in our Brain. Holy Spirit is experienced in our hearts through emotions. Father is seen through the Son, Jesus is visible face of the Father through Holy Spirit. Our God is invisible God, He is humble and discrete. The Spirit is the Ecstasy of God innovates us to the Future. Interpret our life through the Spirit. Urgent need of a pneumatological, Christology. Without Holy Spirit Jesus is past. We have to be open to our Creator. We have to look at the Father and the Son through the Holy Spirit like looking through the a Glass. Holy Spirit is present in everyone, everything, everywhere in Cosmos the matter and the Spirit are inter-connected. Holy Spirit gives the power of innovation. Holy Spirit connects the present and the Future and comes from Jesus in heaven which is new Jerusalem. Eucharist is the apparition of Jesus in heaven. Holy Spirit comes from heaven to the earth till the ends. Holy Spirit is present not only in one place but entire cosmos. It is interconnected. Holy Spirit is Holy and is present in every Religion. Spirit comes from the face of the Abba. Today many people don’t experience God and feel that God is far away. Therefore we have to invite others to enter into the awareness of the Holy Spirit. Holy Spirit is in all Religion and all experience God. Holy Spirit reveals to all and to the whole world little by little. Glossolalia (gift of tongues) moved by the Spirit. He speaks about the pneumatology of communion, the Holy Spirit brings all to gather, connects all and shares everything (Koinonia). Pluralism and interculturalism are present to accept the others as they are, it changes to The Transformation in the life (Islam, Hinduism) and finds the complete truth. When there is transformation it is happens only by Holy Spirit. 1.	the Spirit is free and his action is mysterious, so that He/she goes beyond the spaces and times opened by the Logos of God. 2. It is experienced in heart level and the spirit connects oneself to with the cosmos in the openness. 3. She also gives radiant energy thus going beyond one receives the radiant beauty of God. 5. Unless one opens himself to the Spirit, he cannot understand the work and exitance of the Spirit. 6. The energy of the Spirit of the past throws one into the future, it lingers deep within ourselves to be more energizes in the present. 7. The spirit operator of the future and it always looks for newness of life thus it is innovator of everything. 8. Our God is humble, simple- The experience of the spirit is visible presence of divine grace. 9. Without spirit one lacks spiritual blessings. 10. Karl Barth defends the urgent need of a pneumatological Christology and asks the inclusion of the Veni Creator Spiritus in the theology of Creation. 11. According Theihard de Chardin, The spirit of life is present in every matter and objects. 12. For the spirit everything is possible. 13. According to Wolfhart , Eschatological Pneumatology- Holy Spirit acts as the Anticipator of God in believers and in the Church and everywhere. 15. According to Jürgen Moltmann – Holistic Pneumatology- Holy Spirit present in all things and acts as sanctification of life in the Church. 16. The Spirit becomes force to experience and to connect the beauty of God in its fullness. 17. According to Michael Welker – Realistic Pneumatology- Spirit sees as conflicted territory in a world alive with experiences of the Spirit, searching for Spirit, and scepticism about the Spirit. 18. According to Clark Pinnonck – Systematic Pneumatology- Spirit is present in all the religions and spirit is the revelation and the salvation. 19. According to John Zizioulas – Pneumatology of Communion- Spirit instrument of communion and it connects to the church and to people. 20. According to Karl Rahner – Transcendental Pneumatology- Spirit is the embodiment of transformation of persons. 	Without Spirit there is no connection to God, Jesus, Gospel, Church, and mission. 	Holy Spirit is like a glass through whom we can see God and Jesus. 	Holy Spirit is the gift of the end of the times. 	Where there is life there is Spirit. 	Spirit is holy not because he is far but he is present within the life. 	He Spirit as conflicted territory in a world alive with experience of the Spirit, searching for Spirit, and skepticism about the Spirit. 9. Clark Pinnonck (Baptist), he speaks of Sytematic Pneumatology. 	It is the Holy Spirit reveals, it also brings life and salvation. 	Abba generates the Son in the Holy Spirit, Holy Spirit is also in the Father. Jesus is born from the father and from the Holy Spirit. 	Father is the source of the son, with the Holy Spirit and Mary in our times. The Holy Spirit and Mary are the main actors of that Generation. 	God the father is the only one who conceives Jesus. 	The Father is the lover who conceives and who generates. 	Son is beloved the conceived and generated. (25th March is the Immaculate conception of Jesus). 	It is the effort to recover the value of the physical body in the context of today’s ecological crisis. 	The Holy Spirit is present everywhere. God created everything out of his love, God is a friend to the World. When nature is in danger through pollution we are destroying God’s creation; creation is the body of God which we need to respect and take care. •	Reflection on experience links theology first of all to the doctrine of the Holy Spirit, identified as God present and active in the world. We need to experience the presence of God in everything. o	Church as a missionary movement not us an instittution. o	Holy Spirit is giving us a radical eaquality in the power of the Spirit as in the pentecost. o	All are equal as children of God in the Church, all are brothers and sisters. we make an equal Church, there is only one high preist, no one has more dignity from the Others (LG). 	We look at the Holy Spirit in the Universal perspectives in the mode of going beyond all the Margins to be connected with everyone in the Cosmos. 	Who are reflecting on the Holy Spirit within the context of a cultural understanding of spirit and spirits. •	We see among the Asian Christian Theologians there is a creative thinking about the Holy Spirit. 	God’s dealing with the world is seen primarily in terms of the Holy Spirit. 	The earth is the embodiment of the famine power of God. 	Spirit is very open in the context of Asia. 	We have our own imaginary temples in our life situations to contemplate on Holy Spirit like desert, forest etc. 	Indian Theologians are aware of the material poverty of their people, particularly concerned with the role of Jesus in mediating the presence and salvation of God. Jesus is not only a giver but also the receiver of the Holy Spirit. 	Abba Cannot be the Father to Jesus without the Holy Spirit. In other words : God the Father is the only one who conceives Jesus through Spirit. 	He is towards the creation as Mother, lover and friend. Therefore, any destruction of the nature is the destruction of God. 	She presents a holistic presence of Spirit. 	The Spirit brings closer to God’s experience. 	Flame of Spirit is equal for all of us, therefore, we are the children of God. In the late twentieth century, the Western churches confirmed that the truth that Spirit as God. •	Regarding the mission of the Spirit and the mission of Jesus, the relationship. •	The nature of the Spirit’s involvement in history. •	What does the theology of Spirit suggest about our identity, community and the nature of Christian? 	Holy Spirit reflected on the context of the culture of Spirit and spirits. •	God as Spirit, Spirit of Christology, Spirit as Atman, Antaryamin and Shakti. o	God’s dealings with the world are seen primarily in terms of the Spirit. o	Culture is dominant, here God is considered as Spirit and earth is embodiment of the feminine power of God. o	God is God of the margins and untocuables. o	God is Spirit-which is the inexhaustible aspect of the Diivne mystery. o	It is more of Spirit of Christology, rather than Logos Christology. o	Creation of God is through the Spirit. o	It also recognizes that Jesus is not only the giver but also the receiver of the Spirit. o	Everything is created by God; Jesus is seen as the Spirit. God the Father is the only one who conceives Jesus through Holy Spirit. Spirit is mediation to from Jesus in the womb of Mary. God is seen as a mother, Father, lover and friend of all, hence whole world is God’s body, thus we share God’s body in the Spirit. The Spirit allows a starting point more closely allied to the human experience of salvation”, thus she speaks Spirit to Jesus and to God. According doctrine of the Holy spirit, holy spirit is identified as God. The Spirit which is present, spreads fragrances of Healing, love, peace and justice. She speaks about spirit of equality i.e missionary movement, she finds radical equality in the power of Spirit, because God has sent spirit of god into our hearts. Western theologians began to discuss the presence and activity of the Holy Spirit not only in the church and the human heart but also in the world. The Canberra Assembly of the World Council of Churches in 1991 highlighted controversy over the relationship between the mission of the Son and the mission of the Spirit. God’s dealings with the world are seen primarily in terms of the Spirit, thus understanding that God is Spirit and that the earth is the embodiment of the feminine power of God. According to Felix Wilfred, The Spirit of God is found in the marginalized, peripheries and in the poor. God is the spirit in the poor. The Indian Christology tends to be “Spirit Christology” rather than “Logos Christology”. The starting point is the work of God in the world through God’s Spirit since the creation; Jesus is understood as the fulfilment of that work. Spirit Christology recognizes that “Jesus is not only the giver but also the receiver of the Spirit”. The mystery of God is not exhausted in the revelation in Jesus Christ but is also revealed in other religions”. Spirit Christology is another way of saying that there is more than Christology, beyond Christology there is the Trinity. They understand the event of Jesus Christ from the perspective of the presence and activity of the Holy Spirit of God in the world since creation. The Catholic ascetic, Swami Abhishiktananda described the Holy Spirit as “the advaita of God, the mystery of the non-duality of the Father and the Son”. Sister Vandana speaks a holistic approach to life, which leading to a realisation of oneness with the One Spirit and a connectedness with the universe and with “spiritual” people regardless of gender, caste and religion. Vengal chakkarai regards the Holy Spirit as the continuing presence of resurrected Jesus: “the Holy Spirit is Jesus himself taking his abode within us”. The Spirit, which comes upon the world from outside not within and empowers a process of evolution of creation toward a better humanity. Chenchiah insisted that the uniqueness of Christianity could not depend on its institutions or doctrines but only in its transcendence over other faiths as the religion of new birth by the Holy Spirit. Samuel Rayan portrays the Spirit as a “breath of fire”, who comes “to enable us to re-create our earth, not to put us to sleep” and is present “not in ethereal euphoria, but in committed historical action”. Father thank You so much for your beautiful insights. Ca you explain more on the qualities of the charismatic power? 	Is your founder or your foundress a charismatic leader? Yes, he was a charismatic man. A man moved and led by the Spirit throughout his life, a person full of spirit. He was so fascinating and captivating that whenever he preached many people used to flock to listen to him, a magnetic person. For me he was a super genius, because from his childhood onwards he was so experts in machines. Always he thought of creating something new. And the same style of thought continued in his life. In his preaching ministry too he used various means and ways to reach to the people. He was truly genius. From the sociological perspective I would say that-he had innate desire to save the people from eternal fire. This is was there from his childhood onwards. This was slowly developed in him when the time was urgent, this aspect was awakened. He preached the Gospel to all, for the greater glory of GOD, and salvation of all. This he did in a group, the persons who were filled by the same spirit and desires. He had great power to pull the people towards God. He also had authority over the evil powers. Many were attract to him because of his charismatic preaching. 	Doing everything for the greater glory of God, salvation of oneself and for all. 	Being in community and moving out to preach the Word, just like the apostles. 1. Is your founder a charismatic leader? He is a charismatic leader in his preaching and in bringing the poor souls to Christ. St. Louis de Montfort is preacher of parish missions, for whom the spiritual life cannot be separated from the ministry. He lived his whole life preaching and bringing the poor souls to God. He was true genius and superman because of his service in restoring the spirit of Christianity in the heart of the baptized and in human societies. From his childhood, he had great desire for Christ and he show Christ in everyone. Once in his journey to a parish, he happened to see a poor man who was injured and bleeding, he took him on his shoulder to an unknown house saying, “Open to Jesus Christ”, this shows that he was a man for others in need. This reminds me of the story of a Good Samaritan in the Bible. He made a great impact in the life of the poor; he was one with them in their suffering and pain. At poor house of Paoutha, he found many poor dying of various sicknesses; he embraced them with his love and concern. He cleaned their wounds and fulfilled their psychological desires at the end of their lives. A true model of ‘God alone’ lived in the midst of poor. •	The main style is; we are called to empower the youth, particularly the poor, and all those who are struggling for justice. •	This requires transformation of the persons that they may be able to establish just and fraternal relationships, and attain sustainable development of the society. 	They regard apostolic educational mission as the normal expression of their life of faith and of their religious commitment. •	Montfort’s Mariology and Marian spirituality were completely based on the mystery of Incarnation, where Mary had a unique role to play. Montfort insists that all, to the absolute extent possible, must be given to Mary in order to be given to Jesus. •	The essence of our spirituality, which we inherited from our founder, is: God Alone, Jesus Incarnate Wisdom, The Care for the Poor, The Cross, The Baptismal Promises, Mary; The Consecration to Jesus through Mary. From the Perspective of Genius- Superman- He was a Genius in doing his mission in a unique style. That is reading the mind of the Spirit, he wanted to go beyond the territory while other wants remain in their own realm. From the Sociological perspective – He always initiate the work and entrust it to the group to follow it. Therefore he always gave importance to the group. From the psychological perspective-He was an attractive person who was attracted by many in and outside the group, due to the magnetic power (Jesus) in which he was attached. Home preaching was his unique style which was not found in France at his time. From sociological perspective- She was socialistic woman always tried to do in group all the mission which was entrusted and which she was inspired by Spirit to begin. And she motivated and encouraged the group to be moved with the Sprit and carry out the mission in a very creative way. From psychological perspective- She was so much attracted in and outside the group the manner in which she was committed to fulfil the mission. Main characteristics of your style- Giving priority to the urgent need, to the powerless, weakest at anytime, anywhere, any situation. No rigidity in time, space, any particular mission. Our Founders Fr.John Bonal Cortada and Blessed Mother Maria Rafols Bruno were Charismatic leaders. The Charism our Founders received is dynamic, universal Charity mainly towards the most poor and needy through the practice of Hospitality, always open to the signs of the times in service to humanity for the building a kingdom of heaven on earth. Spanish Government recognized honored them as “Heroes of the City of Zaragoza”, for their heroic services during the French war and the Civil war. Dual Charism : Fr. John Bonal, an young University professor, resigned his job to serve the poor and needy together with Maria Rafols, an young lady just 23 years old. Our Charism is Dual Charism, Spirit-Advaita- communion-oneness. Fr. John became a pilgrim beggar, begging through the villages of war-ridden Spain, collecting anything that the poor villagers gave him for the sick people of the hospital. Months and years he travelled, in summer and winter, on feet or on a donkey through the road-less valleys and plains. In the night, he sat hours and hours at the confessionals and administering the sacraments, counselling etc. After Fr.John’s death, young Maria with her eleven companions took as challenge their existence with the courage, fortitude and Prayer, collaborated with the Spirit in living His Charism-Love. “to serve all kind of sick people without exception, even those of plagues or contagious diseases in the royal and General Hospital of Our Lady of Grace, Zaragoza. The Hospital’s motto was Urbis et Urbis-House of the sick of the city and of the world. Anyone from any country, with any type of illness would get admission and free treatment there. As their name comes from Charity- Love, they were inspired by the Spirit; proposed themselves as a Congregation of Sisters of Charity to exercise charity, mainly with foundling children, with insane people, with the orphans, unwed- mothers and poor girls and women, teaching them without charge, as it is usual in our schools”. We thankfully recognize that our congregation is a gift bestowed by the Spirit of Christ to the Church. Charity is the Origin of our Congregation, the reason for its existence, its specific character, its apostolic mission and the end toward which it is directed. Our Peculiar Style: With heroism our founders and First Sisters committed their life in living the evangelical Counsels through the vow of Hospitality in our communities. With heroism they shared the pain and suffering; in constant attitude of contemplation in action, prayer and work, boldness and risk, abnegation and humility and silence, poverty and simplicity, thus forming the identity of our Congregation. Together with three Evangelical Counsels, we live a fourth Vow-Hospitality-the core of our Charism up to heroism in five continents. Our Hospitality is manifested by the way of Welcoming anyone who comes to us ; the poor and the rich, the child and adult, the sick and healthy, downtrodden, etc seeing Christ in each one. We continue to create and recreate our history and the Spirit invites us to incarnate ourselves where we are and where we live; moved by a hope a gift of the Spirit that opens us to the possibility of believing and creating, we make a reality of this experience of the Spirit; many times the mission is without noise, with humility and with every detail, with total love. Our Motto is Love without frontiers. The Eucharist the sacrament of Love- sign of unity –the Spirit-the bond of charity- is source of life and center of our Communities. In present generation, the sustainable development consists in supporting the possibilities of the future.The environmental, economic and social needs of people of today, as areas of greater needs, mission countries, rural and liminal areas like slums into which the Spirit leads us. 	Our Founders Fr.John Bonal Cortada and Blessed Mother Maria Rafols Bruno were Charismatic leaders. The Charism our Founders received is dynamic, universal Charity mainly towards the most poor and needy through the practice of Hospitality, always open to the signs of the times in service to humanity for the building a kingdom of heaven on earth. Spanish Government recognized honored them as “Heroes of the City of Zaragoza”, for their heroic services during the French war and the Civil war. 	Dual Charism : Fr. John Bonal, an young University professor, resigned his job to serve the poor and needy together with Maria Rafols, an young lady just 23 years old. Our Charism is Dual Charism, Spirit-Advaita- communion-oneness. Fr. John became a pilgrim beggar, begging through the villages of war-ridden Spain, collecting anything that the poor villagers gave him for the sick people of the hospital. Months and years he travelled, in summer and winter, on feet or on a donkey through the road-less valleys and plains. In the night, he sat hours and hours at the confessionals and administering the sacraments, counseling etc. After Fr.John’s death, young Maria with her eleven companions took as challenge their existence with the courage, fortitude and Prayer, collaborated with the Spirit in living His Charism-Love. 	Our Peculiar Style: With heroism our founders and First Sisters committed their life in living the evangelical Counsels through the vow of Hospitality in our communities. With heroism they shared the pain and suffering; in constant attitude of contemplation in action, prayer and work, boldness and risk, abnegation and humility and silence, poverty and simplicity, thus forming the identity of our Congregation. Together with three Evangelical Counsels, we live a fourth Vow-Hospitality-the core of our Charism up to heroism in five continents. 	Claret was born of very rich textile family. He had lot of vision and passion to follow Christ very closely. He had passion for the Saving the souls and he prayed over the visions, That he had and developed a special spirituality for the Kingdom. He Often visited the Blessed sacrament, received blessed mother as his mediatrichs. He was a charismatic and itinerant preacher. During his sermons many miracles happened. 	He wrote many books according to the signs of the times, and was very approachable to the people who were in distress. He wants be an apostolic Missionary to preach the Word of God. 	He transmitted the real Spirit of God to the people by his special style of preaching in the streets and attracted many people to Jesus. His special style of approaching the people was something very unique, bringing peaceful atmosphere in the social issues in the society. 	He was invited to speak in the first Vatican council and contributed his innovative ideas for the Mother Church. He had special devotion to the Mary, He founded the congregation named with blessed mother. Later became the Archbishop of Cuba, he was confessor of Queen Isabella, underwent lot of struggles and slanders during the Civil war. 	Brother Gabriel was Charismatic person he was from devoted family he was a pious boy when he was child he goes to the Church and help in the Sacristy and the priest every day. When he grew up he matured in his vocation and found the Spirit of the Lord and found the Congregation. He wants to found the Religious Brothers congregation in the time of French Revolution. In order to promote the Christian Faith among the People. 	In the out look to see the sociological way of looking at the society our Brother Gabriel was a super man in that time answering to the need of the society through Education especially in Rural Areas. He was promoting the Christian Education and Human Education. He was more close to people and looked at the need of the people in serving to them. In another words to say Brother Gabriel was a mediator between the Priest and the people he was look at the need of both the spiritual need of the people and constant support need of the clergies in the Church. He also look at the need of the moral teaching of the people in the society. 	He took the spirituality from the Holy Family of Nazareth which can become our life style of the Bothers. Gabriel made very nice perfume for us the smell of living with “Family Spirit” we promote the family atmosphere in our Communities and our schools and wherever we are sent.